Whether you are an event coordinator at a convention hall or a pastor at a local church, it is extremely important to make sure your stage is set for success. Public speaking events almost always feature some kind of platform for the orator--usually a podium. Podiums, sometimes called lecterns, serve as the centerpiece for motivational presentations, community talks, award ceremonies, campaign debates, religious sermons, and many other events. Whatever the message may be, choosing the right podium will help ensure that your audience gets the point. Although this article may seem to touch on a rather mundane topic, many who have had the same thought have paid dearly at their presentations. Some of the common problems can include unstable podiums, which can be a distraction to the speaker. Likewise, lecterns that are too tall can distract the audience. A lack of lights or shelving can make for a difficult speech for even the most experienced public speakers. The following information will help you understand what considerations to make when deciding which podium is right for your event. Once you've decided on just the right podium for your speech, you'll be able to spend time perfecting your presentation! First, let's take a look at your surroundings. Are you setting up a podium on the altar at a church? Or, are you preparing for a tech company's product unveil at a classy hotel? Podiums run the gamut from traditional wooden designs to modern, even clear, configurations. You'll want to choose a podium that sets the proper tone for your event. Let's say you are looking to add a podium to your altar. Religious institutions frequently buy models that feature a built-in cross or similar insignia. Shtenders are like Christian podiums, but they are designed for reading from the Torah and often have the "Star of David" on the front. Either way, the symbol on the front can really add to the effectiveness of sermons and Derashot. Companies also add symbols to the front of their podiums to reinforce their brands and let listeners know exactly who is speaking. Adding a custom logo shows that your business is serious and cares about making a positive impact. Imagine you are the spokesperson for a big corporation and you've just nailed a very compelling speech, but everyone forgets which company you represented. Using a company logo as a visual cue will only help reinforce your name and leave a lasting impact. Many podium dealers offer customization options, so consider using that service for the most professional results. Event halls and convention centers that host a variety of different presentations can also add a logo, but many leave the logos off. The absence of a logo provides more flexibility when hosting many types of events. So far we have been talking about indoor presentation venues, but what about events taking place outside? Graduation ceremonies are some of the most common events held outdoors. Election speeches are also frequently conducted in the open air. Really any time an indoor location has insufficient capacity and cannot accommodate the crowd, the event is moved outdoors. Although some outdoor events end up getting rained out, many go on rain or shine. 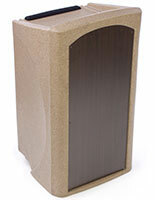 In these situations, it's ideal to use a podium that is designed specifically for outdoor use. Outdoor podium manufacturers produce some of the most durable options. Many are made from a tough recycled plastic that can withstand tons of abuse. Most podiums on the market feature stationary designs that are made for long-term placement. Some lecterns, however, can be knocked down or folded up for easy transport to and from events. Portable podiums are great for trade shows and other temporary setups. 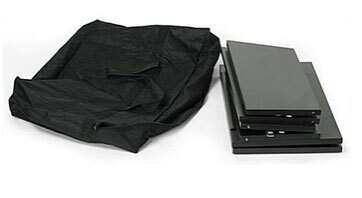 Many knock-down designs have built-in handles or come with carrying cases for enhanced portability. If your presentation will only be set up for a short time, consider a portable podium. As mentioned above, podiums that are too tall can obscure the speaker and distract the audience. Using a lectern with the proper height ensures that the speaker remains visible, but finding one that suits your needs can be tricky, especially if students of varying ages and heights will be speaking. Height adjustable podiums feature manual or pneumatic adjustment and allow for the reading surface to be raised or lowered. It might be wise to purchase a height adjustable lectern if you expect a diverse array of speakers. Sometimes the same person speaks regularly at the same podium, much like the President. Fixed designs work great for these types of applications, however they are somewhat rare. Tabletop podiums offer another good solution for less formal events and can even be used while seated. 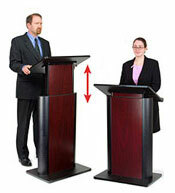 Town hall meetings and committee hearings are some of the most common applications for tabletop podiums. With Integrated Technology or Without? There are a variety of bonus features available for podiums. Perhaps the most obvious is built-in sound. Lecterns that include microphones and integrated loudspeakers are the perfect all-in-one solution. Why worry about finding a suitable sound system or buying the proper microphone equipment when you could get it all in a single, easy-to-use package? Other lecterns come with either attached or clip-on lights to illuminate the reading surface. Lighting is a great way to prevent mishaps in scripted speeches, especially when the stage is only dimly lit. Multimedia podiums, sometimes called smart lecterns, offer a fantastic solution for teachers and professors. Colleges and schools that use a multimedia lectern at the front of their classroom can not only lecture free but they can also supplement their presentations with videos, sound clips, documents, and more. Smart lecterns usually feature cutouts so that the wiring for various technological devices can be hooked up easily. Don’t pull a Marco Rubio! Get a podium with a shelf or attached cup holder to keep a drink close by during every speech.